Note: do not send many email at once from system without knowing the limit of ISP. The email addresses are in different database tables depending on type of record such as account passenger, contact or trip. On Account List and Passengers List windows there is Export Emails button. 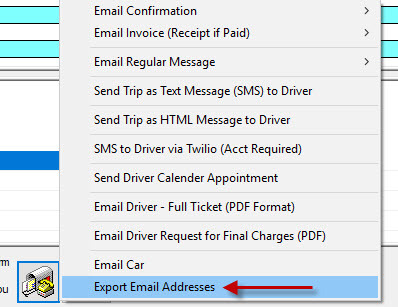 On dispatch window under the MailBox icon button at bottom right, there is Export Email Addresses option in the pop menu.